Dimensions: 5.5" X 8.5" X 0.75"
Padre Pio died September 23, 1968, his funeral attended by over 100,000 people. During the fifty-eight years he was a priest, his monastery at San Giovanni Rotondo, Italy, became a mecca for pilgrims from all over the world. Born Francesco Forgione on May 25, 1887 at Pietrelcina in southeastern Italy, Padre Pio joined the Capuchin Order in 1903 and was ordained in 1910. On September 20, 1918 he received the sacred wounds of Christ, or the stigmata, which he bore the rest of his life. 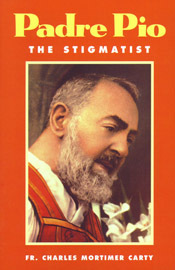 Renowned for the stigmata, which modern medical science could not explain, Padre Pio also possessed other unusual qualities, such as bilocation, celestial perfume, the reading of hearts, miraculous cures, remarkable conversions and prophetic insight. Although he did not leave his monastery and was under obedience not to write or preach, this humble Capuchin monk became world famous for his piety, his counsel and his miracles, and he was universally regarded as a Saint in his own time. Pope John Paul II beatified Padre Pio of Pietrelcina on Sunday, May 2, 1999 in St. Peter's Basilica Square before a throng of 650,000 devotees of this famed 20th-century stigmatist. His faithful followers now look forward with anticipation to his canonization.